Hello! 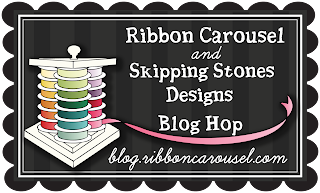 Welcome to my stop on the Ribbon Carousel Skipping Stones Designs Blog Hop! I have a very CAS card to share today. 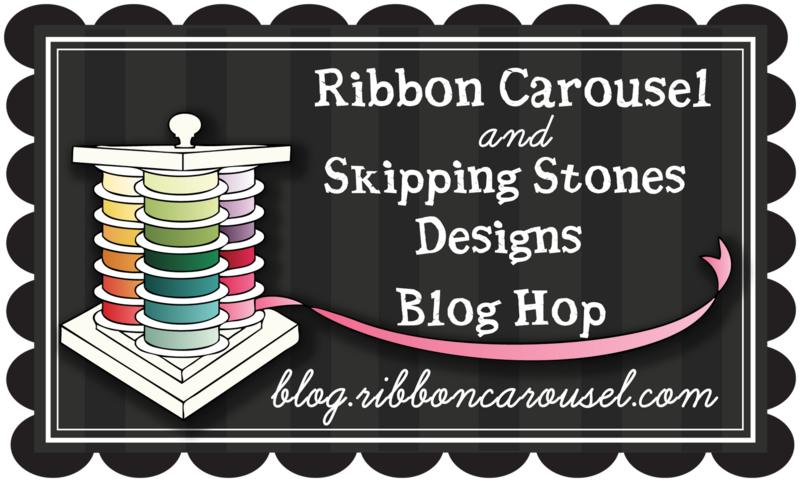 I wanted to play up the gorgeous 1/2" Music Note Twill Ribbon from the Ribbon Carousel and the sentiment from Heartsong worked in perfectly. And how luscious is the Bazzill Card Shoppe card stock? I love how vibrant it is. This colour is Candy Necklace. Fabulous ribbon and great choice of a bold color for the card stock. you make simple look stunning~great card!!! 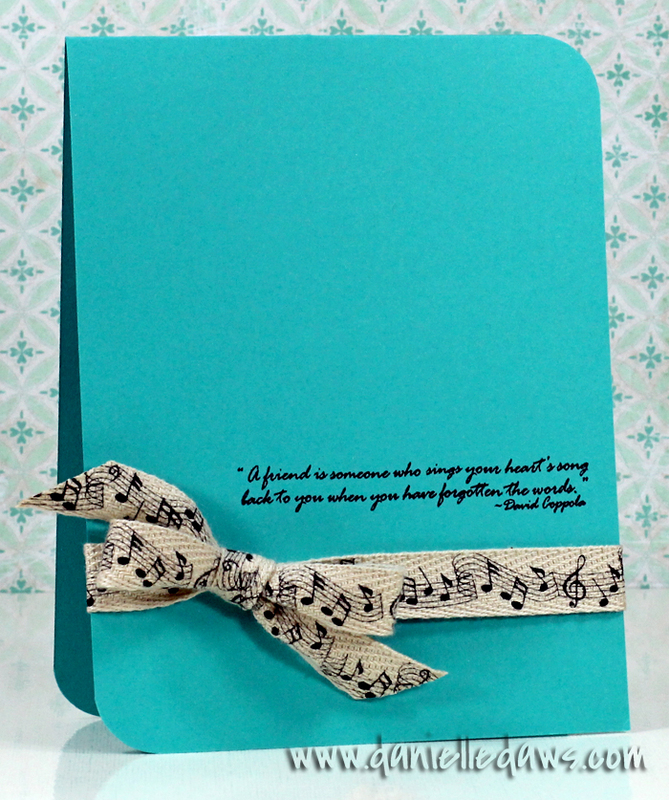 That card stock is gorgeous and I love how the music stamp really pops on the ribbon! Clean and simple IS beautiful. You're right...even though this card is simple, it screams elegance. Very nice! This is more than CAS... it is minimalist (which, to me, is really LESS than CAS!) Whatever... It is cute as a bug's ear! 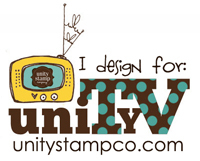 And I have to mention that I LOVE your header for your site. Absolutely adorable!! How perfect is that?! What a great match! This ribbon is spectacular and I adore the clean, simple lines. The sentiment is perfect! What a great match of companies and I could totally do this one! Thanks so much for sharing! Wow! What a beautifull sentiment!! I love it so much! Thank you for sharing! This is stunning in it's simplicity and that color packs some serious WOW factor! That is beautiful - I love it. Way to go Dani!! Ribbon is such a wonderful pop on here! Danielle, I love the simplicity of your card. The color you chose is amazing with the musical ribbon. Thank you for sharing your design and thanks to the Ribbon Carousel and SSD for the opportunity to win their prizes. I love the quote AND your card! 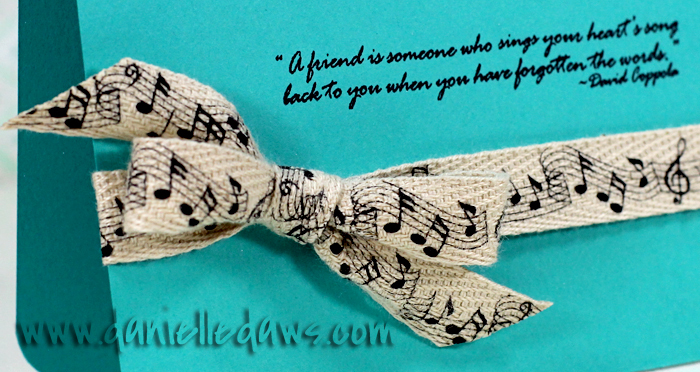 Great use of this fantastic ribbon Danielle! I absolutely love this! That ribbon is adorable. Why do I never make cas cards? They can be so classy! Such a beautiful CAS card!!! 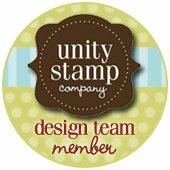 That sentiment goes so perfectly with the printed twill ribbon! Stunning card! I LOVE the musical note ribbon! It's beautiful and so is the sentiment. I love this, Danielle! It really showcases the ribbon beautifully! love this! I love how CAS and effective it is! Just so lovely! Really nice sentiment and ribbon you chose. The ribbon is perfect for your CAS card! Great CAS card! Love that ribbon!